Backgound Patients are at risk for severe postoperative infections after coronary artery bypass graft (CABG) surgery. Clinical laboratory data showed that unbound plasma concentrations of cefuroxime were not always adequate, therefore we developed a new dosing regimen. Objective The aim of this prospective study is to evaluate the new dosing strategy by monitoring patients for unbound cefuroxime plasma concentrations during CABG surgery with cardiopulmonary bypass (CPB). Setting A Dutch teaching hospital. Methods In this prospective trial, patients scheduled for CABG surgery with CPB were included. A starting dose of 1500 mg cefuroxime was given with anesthesia induction, followed by 750 mg cefuroxime every hour until wound closure. In case of renal failure the dosing regimen was adapted. Serial blood samples were collected before, during and after the CPB process. Pharmacokinetic modelling was performed by using an ‘iterative two-stage Bayesian population procedure’. Main outcome measure Unbound plasma concentrations of cefuroxime. Results 22 patients were included, data could be evaluated of 21 patients. In 24 % of the patients the unbound cefuroxime plasma concentration was below the target range during surgery before CPB started. Patients with a bodyweight above 100 kg or age <60 years were more likely to have unbound plasma concentrations below the target range (P = 0.030 and P = 0.008). 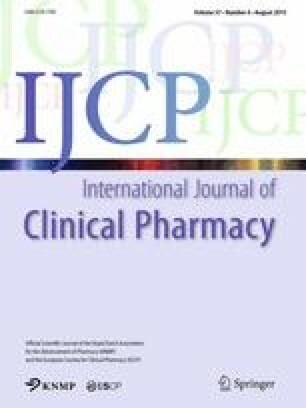 During CPB, the half-life of unbound cefuroxime increased by 17 % and the clearance decreased by 11 % compared to before CPB (P = 0.033 and P = 0.014). The mean pharmacokinetic parameters before, during and after CPB were as follows: elimination half-life 72, 84 and 76 min; clearance of unbound cefuroxime (Clu) 14.2, 12.7, 13.8 l/h and volume of distribution (Vu) 0.280, 0.284 and 0.290 l/kg respectively. Variations in unbound fractions before, during and after CPB were below 2 %, implicating the unbound fraction of cefuroxime is not influenced by CPB. Conclusion Our results show that CPB during CABG surgery does not lead to inadequate unbound cefuroxime concentrations. Age, renal function and possibly also weight are more important factors that can result in unbound plasma cefuroxime concentrations below the target value. The online version of this article (doi: 10.1007/s11096-015-0101-8) contains supplementary material, which is available to authorized users. The authors would like to thank the surgical and anaesthetic team at the Isala Klinieken for their support during the study. The research was funded by the Isala Klinieken, Zwolle, The Netherlands. Module postoperative wound infections after cardiac surgery [Postoperatieve Wondinfecties na Hartchirurgie]: Oral communication with researchers from Prezies. Data will be published in December 2014 at http://www.prezies.nl. European Committee on Antimicrobial Susceptibility Testing (EUCAST). EUCAST breakpoint table version 4.0. http://www.eucast.org. Accessed 20 Oct 2014. CLSI | Home Clinical and Laboratory Standards Institute. Performance standards for antimicrobial disk susceptibility tests; approved standard. Document M100-S21, 2011. http://www.clsi.org/. Clinical and Laboratory Standards Institute. Performance standards for antimicrobial disk suseptibility tests; approved standard. Ed 10 document M100-S20; 2010. http://www.clsi.org/. CBG-MEB (www.cbg-meb.nl)Summary of product characteristics Cefuroxim Fresenius Kabi 1500 mg [Internet] [version 9 oktober 2013]. http://www.cbg-meb.nl/CBG/nl/humane-geneesmiddelen/geneesmiddeleninformatiebank. Accessed 20 Oct 2014.